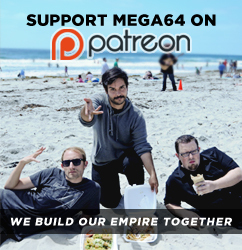 Mega64 Podcast 513 - Garrett Joins the Battle! HEY!!! This is the day we have been waiting over 13 years for...We hired Garrett! We discuss Garrett becoming a full-time Mega64 member, The Big Game, Adam Levine, Super Bowl commercials, Groundhog’s Day, Happy Death Day, Ghostbusters, MLK streams, CBD, alley stories, Ted Bundy, Uber, and losing luggage. Click here for the audio version! Before you go have you seen our new video yet? Check it out here and Let's Remake Everything from 20 Years Ago! !